Control System: This basically means that Git is a content tracker. So Git can be used to store content — it is mostly used to store code due to the other features it provides. Distributed Version Control System: In Git, every developer’s computer has a local repo which has the entire copy of the code with the change history. Git does not necessarily need a central server to work with. But in most projects, git is used along with a remote repository provided by github, gitlab, bitbucket and so on. Will explain more about local and remote repositories in this post. Git itself is not to be confused with github, gitlab, bitbucket and so on. Finally, sometimes several projects which are being run in parallel involve the same codebase. In such a case, the concept of branching in Git is very important. Rather than mentioning all the concepts at once, I will explain the concepts of Git through an example so that it is easier to follow. In your computer, create a folder for your project. Let’s call the project folder simple-git-demo. The git init command adds a local Git repository to the project. Here we will be demoing with just plain text instead of actual code, since the main focus of this article is on Git and not on any specific programming language. Committing is the process in which the code is added to the local repository.Before committing the code, it has to be in the staging area. The staging area is there to keep track of all the files which are to be committed. Any file which is not added to the staging area will not be committed. This gives the developer control over which files need to be committed. Use this carefully since it adds all the files and folders in your project to the staging area. “Initial Commit” is the commit message here. Enter a relevant commit message to indicate what code changes were done in that particular commit. Use git status to find out information regarding what files are modified and what files are there in the staging area — it shows other information as well, which we can ignore for now. The status shows that demo.txt is modified and is not yet in the staging area. git commit -m "demo.txt file is modified"
Use git log to print out all the commits which have been done up until now. The log shows the author of each commit, the date of the commit, and the commit message. Up until now we have not created any branch in Git. By default, Git commits go into the master branch. A branch is nothing but a pointer to thelatest commit in the Git repository. So currently our master branch is a pointer to the second commit “demo.txt file is modified”. Why are multiple branches needed? Multiple branches are needed to support multiple parallel developments. Refer the image below to see how branches work. 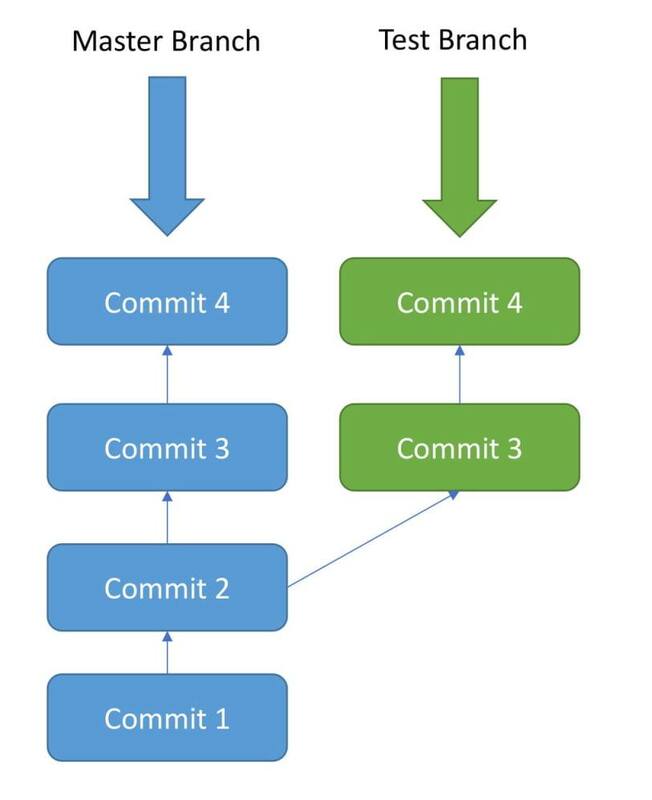 Initially, commit 1 and commit 2 were done in the master branch. After commit 2 a new Branch called as “Test” is created, and commit 3 and commit 4 are added to the test branch. At the same time, a different commit 3 and commit 4 are added to the master branch. Here we can see that after Commit 2, two parallel developments are being done in 2 separate branches. The Test Branch and the Master Branch have diverged here and have different code — the code from Test Branch can be merged with the Master branch using git merge. This will be covered later. This command creates the test branch. Now we are in the test branch. git commit -m "Test Branch Commit"
This commit was done in the Test Branch, and now Test Branch is ahead of Master Branch by 1 commit — as the test branch also includes the 2 commits from the master branch. Currently, Test Branch is ahead of the Master by 1 commit. Let’s say that now we want all the code in the Test Branch to be brought back to the Master Branch. This is where git merge is very useful. After running these 2 commands, the merge should be successful. In this example, there are no conflicts. But in real projects, there will be conflicts when a merge is being done. Resolving the conflict is something which comes with experience, so as you work more with Git you will be able to get the hang of resolving conflicts. Run git log now and you will notice that the master also has 3 commits. Until now, we have been working only in the local repository. Each developer will work in their local repository but eventually, they will push the code into a remote repository. Once the code is in the remote repository, other developers can see and modify that code. Here we will be using GitHub for the remote repository. Go to https://github.com/ and create an account. Give the name as git-blog-demo. This pushes the code from the master branch in the local repository to the master branch in the remote repository.